The Buffalo & Erie County Public Library has been kind enough to share the exhibit labels for its display held in March this year in the Grosvenor Rare Book Room. The section devoted to “Artist’s Book History” begins with the Book of Kells and runs to Ed Ruscha’s Twentysix Gasoline Stations. Although many will claim that artist’s books began with William Blake in the 1700’s or so that would dismiss entirely all of the artistry that went into many lovely and ornate illuminated manuscripts that proceeded and somewhat overlapped the printed text in codex form. 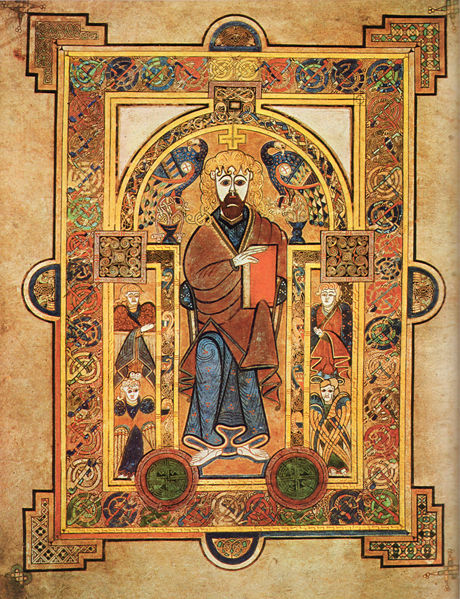 Whether painted in monastic scriptoria, as was the Book of Kells (c. 800), or by secular guild artists as were many others, the figures and/or flora are artworks to behold. 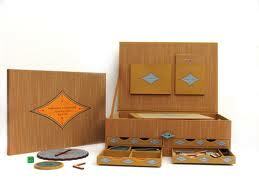 World Wars I & II brought many artist books associated with the Avant-Garde, Futurist and Surrealism Movements. Max Ernst’s Une Semaine de Bonté (1934). 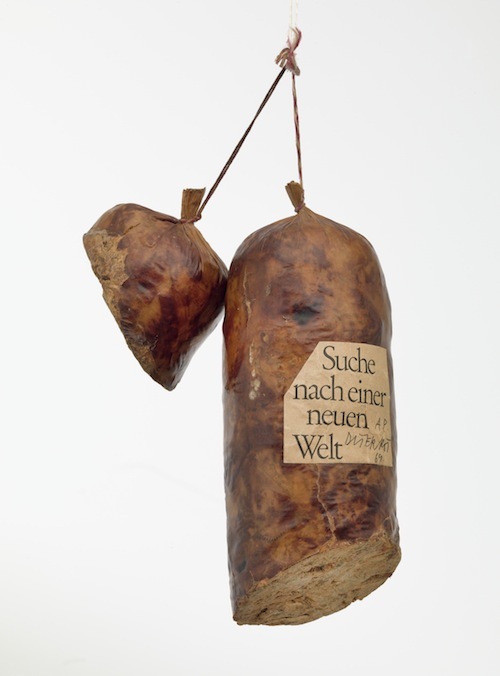 Dieter Roth, “Literature Sausage (Literaturwurst),” 1969, published 1961-70. Artist’s book of ground copy of Suche nach einer Neuen Welt by Robert F. Kennedy. Gelatin, lard, and spices in natural casing. Overall (approx.) 12 x 6 11/16 x 3 9/16 in. The Museum of Modern Art, New York. The Print Associates Fund in honor of Deborah Wye. The second half of the nineteenth [sic] century brought Dieter Roth and Ed Ruscha’s works. 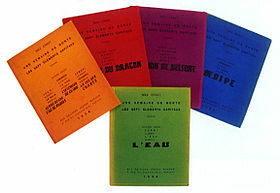 Roth was a Swiss artist for whom the book was just one of his media. Paint, sculpture, installation work and more also provided means of artistic expression. Ed Ruscha is an American pop artist whose focus is in paint, drawing, printmaking and photography. His Twentysix Gasoline Stations (1963) photographically captures gas stations in book form as Andy Warhol did Campbell soup cans on canvas. This artist’s book is considered an important milestone for the genre. 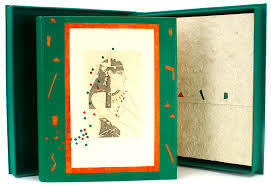 Ruscha’s book also figures in the exhibit section called “Artist’s Books and Bookworks Today” along with works by Julie Chen and Susan Allix as examples of the growing availability of collectible book art today. Julie Chen founded Flying Fish Press in California through which she creates handmade “artists’ books with an emphasis on three-dimensional and movable book structures and fine letterpress printing” according to her web site. These books are frequently moveable and/or interactive in their design. British book artist Susan Allix also has her own (self-titled) press and she creates handmade books with a variety of fine papers and textures with letterpress printing, embossing and all manner of printmaking. Though some of her books convey a certain whimsy, the choice of materials, method of printing and crafts[wo]manship is the result of serious thought, planning and selection. Other sections are devoted to historical examples of illustrated works of scientists such as Vesalius and Lamarck, which are well punctuated by the inclusion of Guy Laramée’s Grand Larousse, Brian Dettmer’s The Household Physicians and Doug Beube’s Fault Lines. 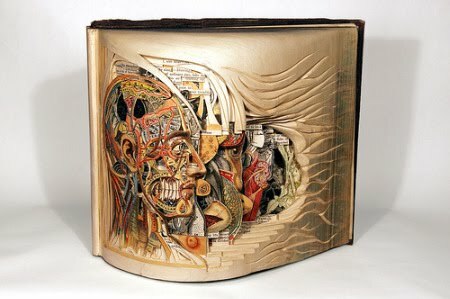 Books altered and/or sculpted by artists to represent something other than the original readable text are known as bookworks and they are works of art. 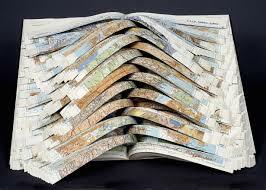 This type of art is not technically an artist’s book whereby a book is created. 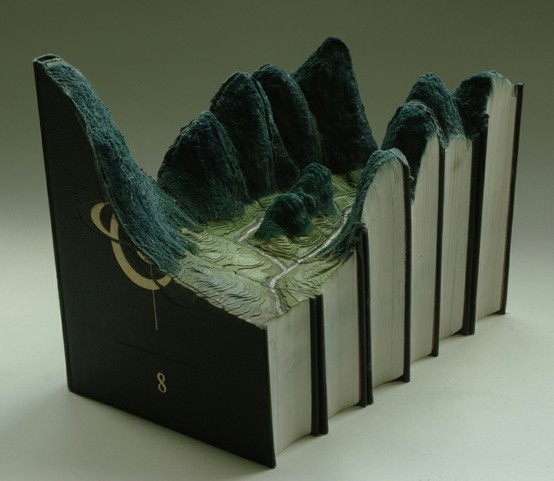 Altered/sculptural books take from a book that had already been created and turn it into art by cutting, folding and/or sculpting it into an art form. Although there are many examples of this type of work, perhaps the most inspiring artists’ works (some available in art galleries today) are those by contemporary and still-creating Canadian Guy Laramée, American Brian Dettmer and Toronto-born, schooled-(in part)-in-Rochester/Buffalo and now-living-in-New-York-City Doug Beube. The examples of their works shown are all pieces inspired by some aspect of science or subject of scientific study including geology, medicine and geography. The theme of the exhibit deserves a catalogue. As the exhibit’s online announcement notes, “Today’s mutually exclusive idea of ‘left-brained’ and ‘right-brained’ activity discounts longer understood ideas that science is a creative pursuit—that there really is art to be found in science—and that creative artworks often have some scientific basis and/or inspiration.” One would do well to start with Harry Robin’s The Scientific Image: From Cave to Computer (1992) and Brian Ford’s Images of Science: A History of Scientific Illustration (1993) and take further inspiration from the Grosvenor Rare Book Room. Permissions courtesy of Amy J. Pickard, Rare Book Curator, Buffalo & Erie County Public Library, 1 Lafayette Square, Buffalo, New York 14203.